Euro 2012 Preview – Group C | Who's Playing Who? Part III of my Euro 2012 preview is here, and it just keeps getting better, with another quality group to put under the microscope. Details of our Fantasy league also inside. While not quite as powerful as Group B, this one comes pretty damn close. The defending champions and current World Cup holders, a rejuvenated powerhouse, a side with a real point to prove and well… the Republic of Ireland, are all here. There’s been a lot of negative talk surrounding this side, and I think it’s justified, to an extent. While their core group of Barcelona players didn’t win every single title this season, they weren’t exactly horrendous. There’s no David Villa or Carles Puyol, but it’s not as if their replacements aren’t fantastic players in their own right. I expect Llorente to get a crack, while David Silva could play a more advanced role, along with of course the rejuvenated Fernando Torres. While they only managed to beat China 1-0 in their last friendly, there are still big things expected of this side. And with the talent at their disposal, could you blame everyone for that? If you’re interested, check out the full bread ceremony below. Nothing like a big delicious loaf after a long bus trip, right? Fantasty Tip: Try and sneak as many Spanish players in as you can. I know they won’t let you take more than two, but come on! How can you decide between them all?! Bottom Line: They might not win the whole thing, but they will be there or thereabouts. Mario Balotelli, Antonio Cassano and Gianluigi Buffon share a laugh (and a kiss?!) on their arrival in Poland. This side really had to shake things up after the debacle that was the 2010 World Cup. And under Prandelli, they’re playing a really nice possession-based style. Things were looking great is qualifying… then they lost 3-0 to Russia just before the tournament. Pirlo is their key in midfield – he pulls the strings. The main problem is going to be up front. Is Mario Balotelli the man to finish all the plays? The enigmatic Cassano? What about Di Natale? These are all questions which will be answered in the tournament. There’s also the issue of the domestic betting scandal – but hey, these sorts of things always seem to happen around major tournaments, and they haven’t fared too badly in the past. Fantasy Tip: I’d be steering clear of the majority of this squad – we just don’t know what we’re going to get. 27% of coaches have picked Abate, I think because of his price more than anything else. Bottom Line: I think they’ll make it through. Just. They are an interesting case. One the one hand, they have a wealth of creativity in attack – look no further than Luka Modrić. Throw in Olić, Mandžukić and Jelavić into the mix, and you’ve got some potency going forward. Captain Darijo Srna is also important. Defensively though, there are some big questions, and this is where I think they will fall down. It might be a bit of a trend at this tournament. But if they can hold onto the ball and let their midfield and forwards work their magic, they will put on a reasonable showing. Fantasy Tip: Go Modrić. Jelavić is incredibly cheap for a forward of his quality, so if he gets a start he could be worth a look in. Already 33.9% of coaches have bought him in. Bottom Line: Potential, but not enough to get through for mine. Geez, they’ve been hard done by. If they were in Group A it might be a different story, but they’re really up against it here. Trapattoni has been criticised for his style of play – essentially parking the bus and hoping for the best. He doesn’t care, and I don’t blame him. He’s driven by results, and he’s got them back to the big time. But if you’re going to let the likes of Spain come and play at you, things could get ugly. It’s not as if they don’t have good players – the likes of Keane, Doyle, O’Shea and young Darron Gibson can all play. And with Shay Given between the sticks, they have a quality stopper. I can’t help but feel he’s going to get a real workout this Summer. Fantasy Tip: Many are picking Andrews as a cheap non-playing reserve, but I wouldn’t be touching any of them if you can help it. Bottom Line: If they manage a first up win over Croatia, they might just be exceeding expectations. Anything more than that would be unbelievable. If you want to go up against us in the official Euro 2012 fantasy game, here’s our league code: 56747-77231. Those are my thoughts on Group C. But I’d be far more interested to hear what you think is going to happen. Leave a comment below, or hit me up on Twitter – @adrmcm or our Facebook page – facebook.com/whosplayingwho. 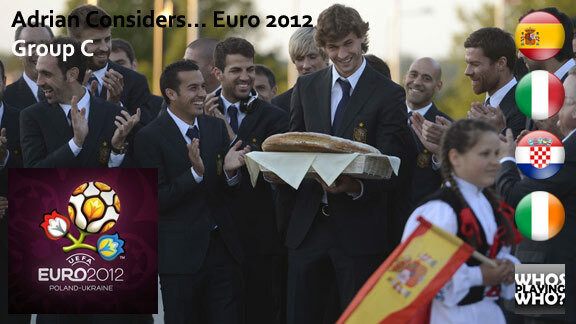 Euro 2012 Preview – Group D « Who's Playing Who? Euro 2012 Preview – Group B « Who's Playing Who? Euro 2012 Preview – Group A « Who's Playing Who?